Last year we painted eggs using bubble wrap. This year we tried a few more things we had laying around the house to paint the eggs. The boys had lots of fun. If your kids are anything like mine, I would recommend putting down a plastic drop cloth or newspaper to cover the work surface! *Aluminum Foil: Crinkle a piece of aluminum foil. Open foil and lightly paint. Place egg on foil and gently press foil around the egg. Remove from foil and let dry. 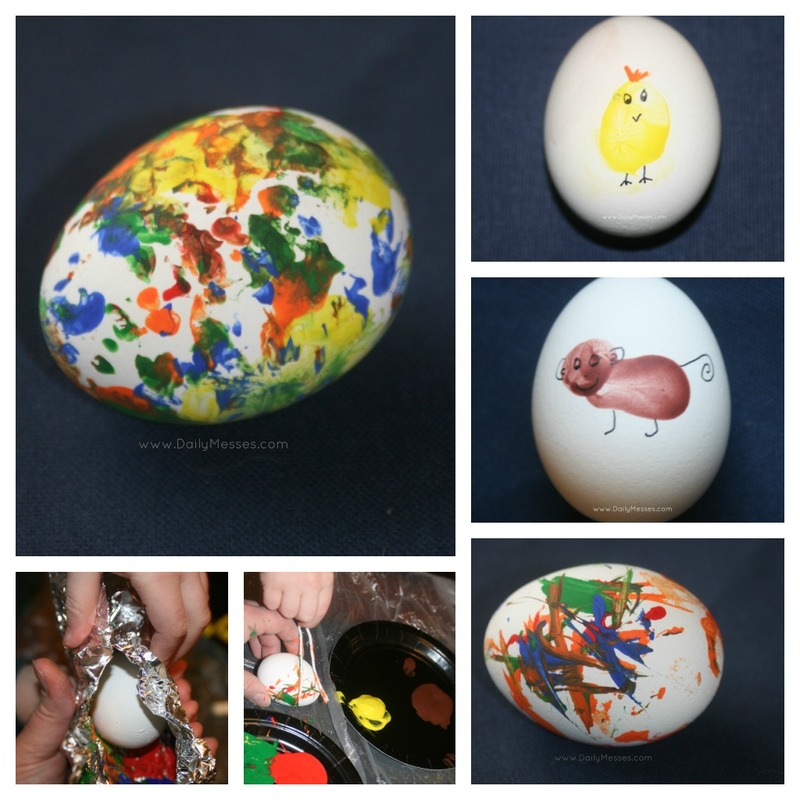 You could paint other pieces of foil and repeat the process for a multicolored egg. Higgins got impatient and put lots of colors on the same piece of foil. It turned out pretty well, although there were a few muddy looking splotches. If you want more distinct colors, I would apply the colors one at a time. *String: Dip pieces of string in paint. Drag across egg to create designs. Use different sizes and textures of string to get different effects. *Fingerprints: Lightly coat your finger or thumb in paint and press to egg. Let dry. Use a marker to create faces or animals. We made a chick and a monkey. Ok, I know it doesn't really look like a monkey, but that is what it is supposed to be. I think I need to work on my monkey making skills. *Light Bulb Wrapper: Ever wonder what to do with the cardboard cushion that comes with your light bulbs? Unfold the wrapper and lay flat with the ridged side facing up. 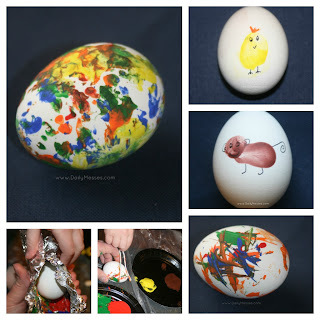 Coat a layer of paint on the cardboard and roll your egg across to get a cool effect. Paint designs on the cardboard before rolling for even more fun. Example: Green on bottom for grass, blue in middle for sky, maybe some bird shapes, and white clouds. *Piece of Lace: Cut a piece of lace to wrap around the egg. Lightly brush on a thin coat of paint to the lace. Carefully wrap around egg, press gently, remove lace. Let dry standing up. *Polka dots: Brush a thin layer of paint on a new pencil's eraser. Gently dab around the egg to create polka dots. Use different colors to add even more fun!